Last year, World IPv6 Day was held on 8 June, where lots of well-known (and some not-so-well-known) Internet sites turned on IPv6 for a day to see what would happen. Well, the Internet Society have come up with a sequel, called “World IPv6 Launch” – to be held on 6 June this year – and this time the plan is not to switch the IPv6 off. Major companies such as Google, Facebook, Yahoo! and the Bing division of Microsoft are taking part, which is probably a large proportion of the IPv4 traffic currently going and up down the Internet today, so it will be interesting to see what effect turning on IPv6 will have. Although it must be said that most ISPs in the UK have been very slow to roll out IPv6, some have and this will at last mean that we get to talk to all these big sites over the new protocol at last. World IPv6 Day – what now? 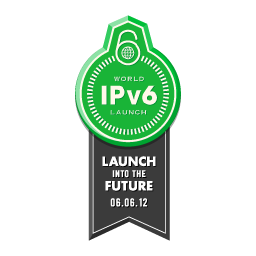 Hopefully most people will have realised by now that last Wednesday (8 June) was World IPv6 Day. The idea of this day was to enable IPv6 on various web sites, including some quite famous ones like Google and Facebook and Yahoo! and see what would happen. But even if the press think or thought it was all one great big massive publicity stunt, what now? Because now, the day is over, and presumably we can all go back to sleep — but sadly we can’t, because IPv4 addresses are still running out. We can’t use NAT, or double NAT, or treble NAT forever. And it left me thinking about what should happen next, because the world after World IPv6 Day doesn’t seem much different to the world before World IPv6 Day. Maybe we should have another one next year…? Thankfully, things do seem to be moving, but slowly. Two big UK ISPs have announced on their respective web sites that they either have plans to roll out v6 or are trialling it – O2/Be are hopefully going to have v6 available at the end of the year, and Plusnet are currently trialling now. And Billion now have a UK version of an IPv6 ADSL wireless router (albeit with beta firmware) also shipping. I’m hoping that when O2/Be roll out their v6 implementation, being one of the larger UK ISPs, that this would entice the likes of BT Retail and TalkTalk to follow suit. Plusnet, although owned by BT, is not really big enough to be called a ‘big player’ in the market. It’s the old problem – the ISPs are claiming there’s no demand, and the service providers can’t roll it out because the ISPs aren’t offering it, which means they can’t create demand. Perhaps things won’t change until the companies that got the last APNIC allocations use their allocations up 9 months hence.